New Human Rights Watch report: Are America’s Allies Committing Ethnic Cleansing in the Fight Against ISIS? Are America’s Allies Committing Ethnic Cleansing in the Fight Against ISIS? 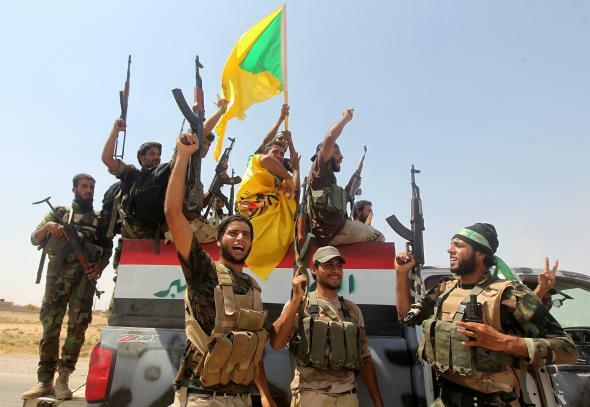 Iraqi Shiite militia fighters raise their weapons as they celebrate pushing back ISIS militants on Sept. 3, 2014, on the road between Amerli and Tikrit. The report also suggests that that the campaign by the Shiite militias was “intended to alter the demographic composition of Iraq’s traditionally diverse provinces of Salah al-Din and Kirkuk.” If undertaken in a systematic manner, a campaign like this is considered a crime against humanity under international law. The implications of this are that in the name of fighting ISIS, the U.S. may have provided air support to the opening phases of an ethnic cleansing campaign. Satellite images show that buildings were destroyed in 30 of the 35 villages examined. In one village, 95 percent of buildings were destroyed. “The widespread burning of civilian homes by the militia groups in areas under their control appeared to have had no clear military objective and to represent collective punishment against residents of local Sunni villages,” the report claims. Human Rights Watch also collected reports of the abduction of at least 11 men who had returned to their villages following the fighting and been accused of being members of ISIS; five of them have still not been returned. Those who’ve been released by the militias say that they were tortured. The Shiite militias had been accused of human rights abuses long before ISIS entered the picture, but their prominence grew when Iraq’s senior Shia cleric, Grand Ayatollah Ali al-Sistani, issued a call to arms last summer following the implosion of the Iraqi army at Mosul. The role of these roughly 20,000 fighters, who speak openly about receiving “unconditional” support from Iran, has alarmed Iraq’s Sunni population as well as Sunni government partners in the coalition battling ISIS. HRW has previous documented multiple cases of militias killing Sunni civilians. The latest report comes at a time when the militias are taking a lead role in the ongoing campaign to recapture the predominantly Sunni city of Tikrit. The U.S. claims the militias are cleaning up their act in the Tikrit operation under the orders of the Iraqi government, Sistani, and Qassem Suleimani, the Iranian commander believed to be coordinating the operation. “The Iranians want to have influence in eastern Iraq and are not looking to jeopardize that. If they turn Tikrit into a sectarian battle, they will ultimately lose influence in Iraq,” a U.S. official recently told the Wall Street Journal. “We believe privately Suleimani understands that any war crimes in Tikrit are problematic.” I can’t imagine that American assurances about the good intentions of an Iranian spymaster are all that comforting to Sunnis.